A Big WOW and THANK YOU!!! If you’ve read my previous post, then you know that I have joined a wonderful group called Operation Baking GALS. I just heard about this group recently, decided to get more info, and then decided, “Hey, I’ll just dive into this head first and be a team leader this month!” I was a little nervous about taking on the role of team leader my very first time even doing anything with the program. After all, do I really know that many people who would be willing to bake a box of goodies and ship them to my chosen soldier (obviously Luke!) and his fellow soldiers?? But I decided to go for it. The response for this – was AMAZING!!!! I posted it on both of my blogs, my Twitter, and my Facebook and I have had an overwhelming response. Normally they like to cap the groups off at 20 so of course my goal was 20. 🙂 I thought it might be farfetched but you know what? I am up to EIGHTEEN signed up so far!! WOW WOW WOW! So I just wanted to post a giant THANK YOU to everyone who has agreed to help me on my first whirl as team leader for the GALS. It means so much to me because I’ve become really excited about this project and my brother has already told his fellow soldiers that they would be getting a big load of goodies soon so they are awaiting the arrival of all the yummy goodness! I am excited because tomorrow officially begins the shipping dates for the baked goods. The shipping dates are July 1 – July 11 for this round. I plan on baking this weekend and shipping on July 6 (which is also my two year wedding anniversary I might add!). I really really want to send my famous sugar cookies (er, Erin’s famous sugar cookies…) because my brother loves them and requested them but I’m way too scared of the icing melting I think. I may try a few and have him let me know how it goes. Other than that I’m making apple spice cookie bars, snickerdoodles, magic in the middle cookies, and chocolate chip cookies. My family and I love sending care packages to him. They LOVE receiving things from home. When I saw this wonderful baking group, I knew it was perfect for me! I get to bake AND do something good at the same time? Sign me up! 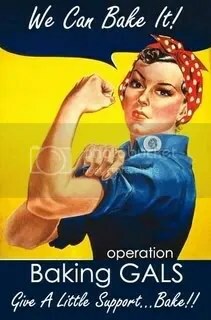 I have now signed up to be a team leader for Operation Baking Gals for the July shipment. Now all I need is a team of bakers! I have a few people who have already committed but I definitely need more – I need to get about 20 people if at all possible. It’s very easy-all you have to do is make some baked goods that can be shipped overseas (basically just nothing that will melt), and ship them out between July 1st and July 11th. The baked goods will all go to my chosen soldier – my brother – and he will then disperse them throughout his group. How awesome is that?? I’m beyond excited to be a part of this group and I hope I can continue to be a part of it. Baking GALS (GALS stands for Give A Little Support) is a group of volunteer bakers who bake and ship homemade goodies to our heroic troops that are currently deployed. Each soldier is “Hosted” by a blogger, and potential bakers are “recruited” from the bloggers own site as well as the GALS site. Each Host recruits between 20-25 bakers, meaning LOTS of goodies get delivered to our soldier…so many, in fact that he or she has plenty to share with their fellow troops! Why do we do it this way? Why not just ship to “Any Soldier”? Well, we don’t know “any soldier” – and “any soldier” doesn’t know us. And recieving baked goods from a stranger, while probably safe, is frowned upon and in many cases, those Any Soldier gifts could be thrown out. Baking GALS will introduce you to a soldier. You will know his name, a little bit about him, maybe even his favorite cookie…and he will know in advance that he will be on the recieiving end of a cookie bombardment – so everyone is prepared. It is a safer way to treat our troops, and it helps them to know when to expect a barage of goodies. So who wants to help out with my team??? I realize it’s kind of short notice but you have almost two weeks to get it done. Support your troops and get to do something you like to do at the same time! If you are interested in being on my team, please email me at mrsabybaby@gmail.com and I will send out all of the necessary information once the team is all together. Checkity Check out my other blog update! As most of you know, I also write a blog about my experiences of having my little brother deployed in Iraq. I’ve been doing a horrible job of updating this blog but I’m trying to get back in it just like I have this one. I updated it this morning if anyone is interested in seeing how he is doing. Please check it out! I haven’t been able to update much lately – it seems like I’ve been slammed with things going on! We had the holidays, then Sheridan’s birthday weekend, then Tommy and I went to Puerto Rico then literally less than 12 hours after returning from Puerto Rico my good friend Lindsay and I made a road trip to Washington DC for the inauguration! Whew! I’m finally starting to recover from everything. I have a few actual cooking updates to do at some point. I am hoping to get to them this week – it’s (supposedly) about to drop a major winter storm on our area so I’m praying for some snow days from work – we’ll see how that goes though! Anyway, here are some visuals for you of my past whirlwind month! …..temps were not so warm here! Lindsay and I standing in the WWII Memorial – that is where we stood for the inauguration ceremonies. We were two of millions there to watch. The whole experience was AMAZING!! We went sightseeing the next day – notice how bundled up I am and I was still freezing! I finally got a Kitchen Aid stand mixer for Christmas – YAY! I’ve been putting off really asking for one because I had the excuse of not having room in my kitchen but finally this year, I broke down and asked Tommy for one for Christmas. I figured that I could just make room. I felt that I needed one or my life wouldn’t be complete. And after many discussions with my good friends Nikki and Clara over which one to get (Nikki made it quite clear that the most important question was “what color do I want?”- ha). So after making my decision, my wonderful husband bought me exactly what I wanted – the Artisan, 5 qt in…Gloss Cinnamon! It matches my kitchen so perfectly. I want to just pet it and look at it. I’m in love with it. Best. Gift. Ever. Today is Will’s 5th birthday – that is a big one to a little boy!!! Being able to say he is 5 is huge! 🙂 I just talked to him on the phone and he thought he didn’t turn 5 until his actual party which is on Sunday so he was quite excited to learn that he can actually say he is 5 today. HA! I am such a sentimental person in case you haven’t figured that out by now. Not so long ago I needed a really good mixing bowl since I’ve started baking more. My mom gave me one that she had – it wasn’t anything special really, but since she gave it to me, it instantly became special. Last week, I opened the cabinet where my bowls are kept and out rolled that bowl onto the floor and it crashed into about 40 pieces. I wanted to cry. When Tommy came home I told him and he felt so bad for me so he told me to buy some new mixing bowls. I wasn’t that into shopping for “new” mixing bowls. I wanted that one. I looked at Bed Bath and Beyond, Linens N Things, WalMart, etc., but I wasn’t into anything. I decided to look on ebay, so I typed in “mixing bowls” and on the first page came up a Pyrex bowl that was the Spring Blossom pattern. I instantly knew that I HAD to find a full set of these bowls and buy them immediately! You see, these were the bowls that my mom had when I was little. I remember these bowls vividly – no matter where we went, these bowls went. Since we moved so much, I’m not sure what happened to her set, but I knew I wanted these bowls so everytime that I used them to bake and cook, I would be reminded of growing up. I’m still alive! I promise! I promise I’m still alive. I haven’t been sucked up by aliens and just disappeared (my mom will appreciate that remark – I’ve dealt with people in my life being sucked up by aliens..). I have been so busy lately with work, t-ball games, softball games, working in the yard, and trying to stay sane that I haven’t had much time to try any new recipes. I’ve just been using the old stand-bys. However, you will be happy to know that two nights ago I sat down and looked up several new recipes that I want to try and I will be getting back into the swing of things next week. I am excited about it! 83. My best friends from roughly age 3-10 were boys. They had He-Man toys which were the equivalent of Princess of Power. It worked out well. 84. I love to wrap presents. I’m a freak about it. 86. I am currently obsessing over the beginning signs of wrinkles on my face. 87. I will never tan again due to this. I will be the one in the big floppy hat on the beach. 88. My dream vacation is Italy – I’m dying to go to Tuscany and drink wine for 2 weeks straight. 89. I love to read – mostly chick lit. I love escaping from reality sometimes. 90. I have “white coat” syndrome. I’ve passed out in every doctor’s office known to man for no good reason. 92. I am absolutely NOT a morning person. At all. Don’t talk to me until at least 10am. 94. I prefer black ink to blue ink. 95. I hate when I am baking and I mix up a bunch of stuff that includes powdered sugar and the powdered sugar flies everywhere. That really annoys me. 96. My favorite cuisine is Italian. Our favorite restaurant in town is this little Italian place on the walkway called Angelo’s. It is Fierce. 97. I can’t stand to be around people who think they know everything. It is completely annoying. 99. I love the beach. I would love to live near the beach someday year round.